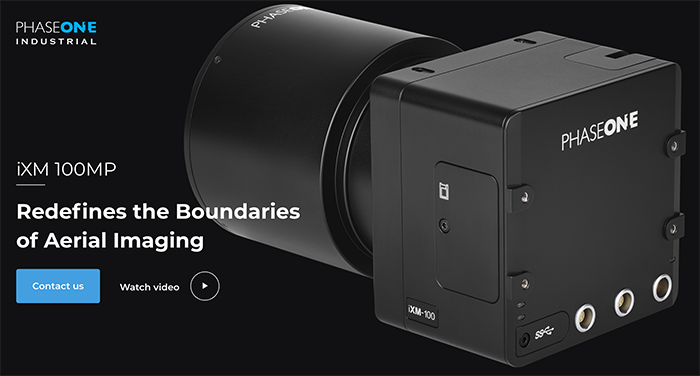 Phase One has just announced the iXM 100MP camera for aerial imaging. It boasts Sony’s medium-format sensor which will also be used in Fuji GFX-100S and Hasselblad X1D-100c. Priced at $40,000, Phase One iXM 100MP is not going to be for the average drone photography enthusiasts. Its sensor alone packs a lot of features not available in other UAV cameras. Its frame size is 33 x 44mm. and has a resolution of a whopping 100MP. The sensor also incorporates backside illumination technology for better light sensitivity and dynamic range. The iXM’s ISO range can go up to 6,400, which is more than the maximum ISO of most aerial cameras. Phase One also offers its own series of lenses built specifically for the iXM. They offer 35 and 80mm. fixed focus lenses, as well as 80 and 150mm motorized focus options. They have an integrated leaf shutter that can capture 3 fps with shutter speeds of up to 1/2,500 sec. The iXM 100MP would appear to compete directly with Hasselblad’s H6D-100c, which is also a dedicated aerial camera. However, despite being released last year, some of the H6D-100c’s specs still beat the Phase One camera. It has a bigger 53.4 x 40.0mm sensor and can go up to ISO 12,800 (double than that of the iXM 100MP). Now that Hasselblad is partly owned by DJI, the competition could be tough for anyone entering the aerial photography business–including Phase One. Before the iXM 100MP was released, DJI and Hasselblad even already had a formidable aerial photography rig using an a5D camera attached to a Matrice 600 drone. Having said that, I’m not suggesting that the iXM 100MP’s future looks bleak. Before I make any judgment, I want to wait for its release in June and see its real capabilities. For more information, you can also visit Phase One’s website.